Wegener's granulomatosis (WG) is an uncommon autoimmune disease with multi-system involvement that manifests as vasculitis, granulomatosis, and necrosis. While its standard form involves the upper and lower respiratory tracts and kidneys, it may essentially involve any organ. We present a case in a young female patient presenting with symptoms of cough with expectoration, fever, dyspnea and chest discomfort, having cavitating lesion in right upper lobe and nodule in left upper lobe with bilateral paranasal sinus involvement on computed tomography. Allergic rhino-sinusitis with pulmonary tuberculosis was suspected, and patient was investigated further. 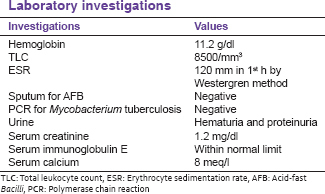 Upon further investigation, renal involvement was detected, and serology revealed cytoplasmic antineutrophil cytoplasmic antibody. WG was suspected and was proven by histopathology of nasal tissue which revealed necrotizing granulomas. This case report highlights the importance of systematic clinico-radiological correlation with histopathology, leading to the diagnosis of an uncommon, but lethal condition, Wegener's granulomatosis (WG) in an unsuspecting young female patient. WG was described in detail by Friedrich Wegener in 1936. The incidence is estimated to be 5-12 new cases/million per annum in the United States. WG is characterized by the triad of granulomatous lesions of the upper and lower respiratory tract, focal segmental glomerulonephritis and disseminated necrotizing vasculitis. A 29-year-old female patient presented to our department with symptoms of cough with expectoration, fever, dyspnea and occasional chest discomfort. On further elucidation of patient history revealed, nasal blockage on and off, nasal discharge, foul smell coming from nose and mouth. On clinical examination, patient had a clear chest and nasal mucosal hypertrophy with polypoidal projections with provisional clinical diagnosis of allergic rhino-sinusitis with polyposis. Computed tomography (CT) scan of paranasal sinuses revealed bilateral para-nasal sinus soft tissue opacification (most marked on the left side) with the extension of pathology in the nasal cavity with deviation of the nasal septum to the right side. No intracranial or intra-orbital extension of pathology was noted. Her chest X-ray revealed thick walled cavity lesion in right upper zone and nodular lesion in the left upper zone, with subsequent CT chest revealing cavitating nodule in the right upper lobe and small pulmonary nodule in the left upper lobe [Figure 1]. Allergic rhino-sinusitis with pulmonary tuberculosis (TB) was suspected on clinic-radiological basis. Patient was started on antitubercular therapy, but there was no improvement in symptoms. The patient was further investigated. Renal functions were deranged, and ultrasound of the abdomen revealed bilateral increased renal parenchymal echogenicity with normal renal size. Cytoplasmic antineutrophil cytoplasmic antibody (C-ANCA) was positive in serum. Based on the complete radiological findings with relevant clinical and pathological data a possibility of WG was suggested. The diagnosis was confirmed by histo-pathological examination of nasal tissue biopsy, which revealed granulomatous inflammation [Figure 2]. The patient was started on corticosteroid with cyclophosphamide. Repeat CT after 6 months showed marked resolution of the soft tissue swelling which was maintained over a period of 3 years. The presence of two or more of these criteria has a sensitivity of 88% and a specificity of 99%. , Pathologically, WG is characterized by necrotizing granulomatous inflammation of small vessel walls, resulting in areas of necrosis surrounded by hemorrhage, small micro abscesses and granulomata within the lungs. A normocytic anemia, leukocytosis, elevated erythrocyte sedimentation rate, positive rheumatoid factor and ANCA (specifically PR3-ANCA) are often shown on serology. PR3-ANCA is positive in 85% of patients with active multiorgan WG, but this reduces to 30-40% in remission. , C-ANCA has a high degree of association with WG and it is positive in >90% patient with active disease. The presence of C-ANCA is not required for diagnosis of WG by either ACR or Chaper Hill Consensus Conference definitions. Rarely elevated C-ANCA may be found in association with other autoimmune diseases, e.g. microscopic polyangitis, Churg-Strauss syndrome, systemic lupus erythematosus, polyarteritis nodosa and Takayasu disease. However, these diseases can usually be differentiated from WG on the basis of clinical, serological, histopathology and imaging findings. 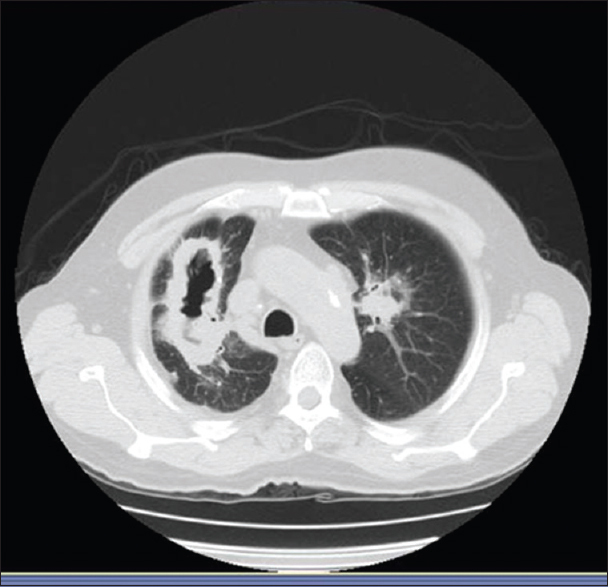 The study of this case emphasizes that, WG must be considered when assessing patients presenting with common respiratory symptoms along with signs and symptoms of rhinitis, multiple nodular opacities on chest radiograph, in the absence of primary or secondary malignancy, fungal disease, pulmonary TB and sarcoidosis. Wegener's Granulomatosis is a rare and invariably fatal form of systemic vasculitis, but early diagnosis and management have significant positive impact on future outcome and prognosis. High degree of suspicion is needed in TB endemic areas as mode of presentation of either disease may considerably overlap at some stage of the disease course. Study of this case emphasizes the need for careful consideration and systematic analysis of patient's presenting respiratory symptoms and signs suggestive of pulmonary TB, and hence that the diagnosis of systemic vasculitis like WG will not be missed or delayed. Seaton A, editor. Pulmonary lymphocytic angitis and granulomatosis. In: Crofton and Douglas's Respiratory Diseases. 5 th ed. London: Blackwell Science Inc.; 2000. p. 1063. Sneller MC, Langford CA, Fauci AS. The vasculitis syndromes. In: Kasper DL, editor. Harrison's Principles of Internal Medicine. 16 th ed. New York: McGraw-Hill Companies; 2005. Leavitt RY, Fauci AS, Bloch DA, Michel BA, Hunder GG, Arend WP, et al. The American College of Rheumatology 1990 criteria for the classification of Wegener's granulomatosis. Arthritis Rheum 1990;33:1101-7. Hoffman GS, Kerr GS, Leavitt RY, Hallahan CW, Lebovics RS, Travis WD, et al. Wegener granulomatosis: An analysis of 158 patients. Ann Intern Med 1992;116:488-98. Rao JK, Weinberger M, Oddone EZ, Allen NB, Landsman P, Feussner JR. The role of antineutrophil cytoplasmic antibody (c-ANCA) testing in the diagnosis of Wegener granulomatosis. A literature review and meta-analysis. Ann Intern Med 1995;123:925-32. Alam A, Dastider R, Ahmed Z, Rabbani R. Wegener's granulomatosis mimicking pulmonary tuberculosis. J Bangladesh Coll Phys Surg 2012;30:98-104.